Thread: Did you ever tried Google in Hindi? Have a look! Google serves its users in several languages among them Hindi is also present. Today I was just checking the Hindi version of iGoogle and I found it interesting and amazing. For experiencing the same you simpy choose Google in Hindi and you'll see following kind of Google view. 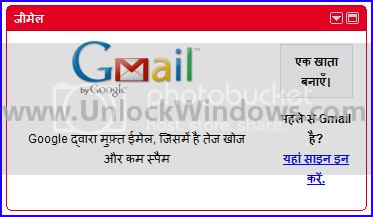 Its a Gmail Home page in Hindi. In case of searching just type what you want ot search for and it will automatically converts that in hindi. Your text as like here I type taj and serah results are in hindi about Tajmahal. Thats it. Here we can see the Hindi look of iGoogle and Gmail, and is looking awesome and feels good to see our language. So what are you waiting for just try it. The list of all the google domains on that site IS AMAZING!!! !